Children should be the prime target of malaria control as they are ones most likely to be bitten by mosquitoes carrying the parasite, say researchers. About 80% of all new malaria infections are concentrated in just a fifth of the population, a Nature study of African children found. So people who claim they are always the target for mosquitoes while others never seem to get bitten may be right. 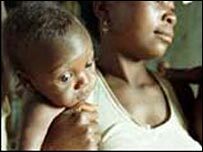 Malaria kills about 2m people each year, most of them children under five. The study looked at field data from a number of studies of mosquito behaviour and records of infections in around 5,000 children aged under 15 living in more than 90 communities across Africa. It is not clear why some children provide a more attractive target for mosquitoes carrying the malaria-causing parasite, Plasmodium falciparum, but they do. The mosquito picks up the parasite by taking blood from an infected person and then hands it on in its saliva when it takes a blood meal from someone else. In the study, the children remained infectious for about six months on average. Furthermore, once they had cleared the infection, the children were not immune to new malaria infections. Lead researcher Dr David Smith, from the National Institutes of Health's Fogarty International Centre in Washington, said the findings suggest that malaria will be much more difficult to beat if control measures are applied uniformly across populations. Instead, he said it might be better to target those who are bitten the most - children. But Dr Simon Hay of the Wellcome Trust, who helped with the study, said that identifying this small group of children in any particular locality was likely be very difficult. "What is clear, however, is that interventions targeting prevention of bites from malaria-carrying mosquitoes should be delivered as widely as possible in a community to ensure those contributing most to the perpetual transmission of the parasite are protected from doing so. "The current target of 60% coverage, set by the African heads of state in Abuja in 2000, might be too low," he added. Dr Martin Donnelly, lecturer in Vector Biology at the Liverpool School of Tropical Medicine, said: "We should be going up to 80% for this mass effect." He said that wider use of insecticide-treated bed nets would help. As well as reducing the chance that the person sleeping under the net will be bitten, people sleeping in close proximity to them also appear to be conferred some protection against bites. Dr Donnelly added: "Very little is known about what attracts mosquitoes and how mosquitoes would differentiate between different humans." He said researchers at Durham University had found pregnant women appeared to be particularly attractive to mosquitoes. Similarly, work has suggested that people who have transmissible malaria in their blood are also more attractive to the insects.